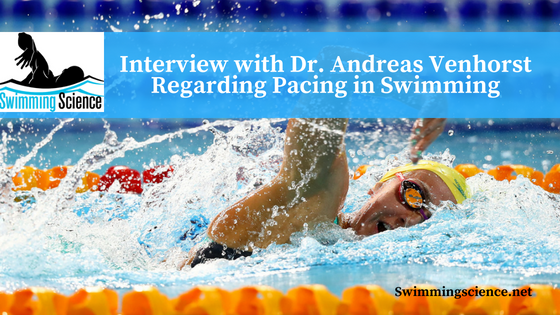 Below is an interview on pacing in swimming with Dr. Andreas Venhorst. Andreas does research in Physiology, Sports Medicine, and Sports Psychology. The current project he is involved in is ‘The psychophysiological determinants of pacing behaviour and performance during prolonged endurance exercise.’ You may view his ResearchGate here. 1. What are the most common pacing strategies in sport? variable pacing (i.e. repeated fluctuations in power output throughout the event). For a classic review see Abbiss and Laursen, 2008 . The selection of the most appropriate pacing strategy for a given event is primarily dependent on the duration/distance and thus the physiological requirements of the event. Other contributing factors are performance level, environmental factors, and tactical considerations amongst others. In addition, there are subtle differences between different sports codes such as swimming, cycling, running, rowing, and speed skating due to the medium they take place in (i.e. water or air) and thus the differences in resistive forces that need to be overcome. For example, cyclists and speed skaters can use more aggressive (i.e. positive) pacing strategies than rowers or swimmers as lower resistive forces of air compared to water are less debilitative to the maintenance of speed in the face of gradual declines in power output. In general, all-out strategies are considered optimal for events taking less than around 40 seconds (although cyclists and speed skaters for the above-mentioned reasons can extend this to around 60 seconds). Positive pacing profiles are usually observed in events taking 40 seconds to two minutes, as a relatively great percentage of race time is spent in the acceleration phase and the energy required to accelerate is greater than the energy required to maintain velocity once achieved. However, positive pacing behaviors are also observed during ultra-distance events where various fatiguing mechanisms prevent the maintenance of an even pace in the latter stages of the event. Events taking from two to three minutes to around 30 minutes often show parabolic pacing profiles with varying degrees of a fast start and endspurt and thus anaerobic energy contributions. Even pacing is generally considered optimal for prolonged endurance exercise taking from around 30 minutes to several hours as it minimizes time spent above critical power and thus exposure to non-linear increases in the physiological disturbance. For an excellent introduction to the pacing, literature sees a recent textbook by Kevin G. Thompson, Pacing: Individual strategies for optimal performance, Human Kinetics, 2015 . 2. Do swimmers follow the traditional pacing strategies? In general, similar distance/duration dependent pacing profiles are observed in swimming. 50m and 100m events show all-out and positive pacing profiles, respectively. 200m events usually show fast-start-even pacing, while 400m events frequently show parabolic pacing patterns; more specifically reverse J-shaped profiles . 800m and 1500m, as well as open-water events, are largely even paced with a short final endspurt. For a recent systematic review on pacing in swimming see McGibbon et al., 2018 . However, there are subtle differences in these general pacing profiles in swimmers, which is mainly due to the low mechanical efficiency of swimming, the large resistive forces of water compared to air, and the dive start. The first lap is always the fastest due to the peak speeds achieved during the grab start and subsequent dive phase. Thus, swimmers do not have to spend a lot of energy and time accelerating like cyclists, speed skaters, rowers, and runners. However, like rowers, swimmers must deal with large resistive forces of water compared to air and interface friction. This necessitates minimizing variations in speed as the energy requirements for acceleration are drastically increased. In addition, premature fatigue needs to be avoided as the effects of fatigue-induced declines in speed are more devastating than in land-based sports. Accordingly, the variability in speed is less pronounced in swimmers when compared to runners , and pacing profiles generally more evenly distributed. This is further emphasized by the fact that tactical variations in speed (e.g. intermittent surges to get rid-off a drafting competitor) are reduced as pool-swimmers compete in separate lanes. Unlike open-water swimmers, pool-swimming competitions, therefore, more closely resemble individual time trials rather than head-to-head competitions. Furthermore, there are subtle differences in pacing profiles between the different swim strokes. Butterfly and breaststroke show greater declines in speed during the 50m and 100m events towards the end, and also slightly positive pacing profile over 200m in contrast to more evenly paced profiles in freestyle and backstroke swimmers . The main reason for this difference is due to the much greater technique-based intra-cyclic speed variations between the strokes, which render butterfly and breaststroke significantly more inefficient and prone to fatiguing effects. In addition, butterfly and breaststroke swimmers are more constrained in off-setting the effects of fatigue on stroke length, as the compensatory increase in stroke rate proofs to be inefficient compared to crawl strokes. The greater efficiency in crawl strokes, therefore allows for greater behavioral flexibility in terms of pacing strategy, particularly during open-water events. Thus, greater variations in speed, particularly during the last lap are a common observation in 200m butterfly and breaststroke events , while middle-distance elite freestyle swimmers manage to maintain or even marginally increase swim speed in the final lap . This holds particularly true when a comparison is made between medallists and non-medallists , with the latter showing greater deterioration and fewer accelerations, respectively. 3. What errors do most swimmers make during pacing? In general, the pacing literature shows that experienced and well-trained swimmers have well-developed and robust pacing skills. For example, the pacing profiles of international freestyle swimmers over race distances varying from 100m to 400m are usually very similar between athletes (i.e. low inter-individual variation) but also between heats and competitions (i.e. low intra-individual variation) . Thus, the observed performance differences are often equally distributed over the race distance/duration with marginal differences in each section accumulating throughout the event. Similarly, competitive freestyle swimmers seemingly opt for similar pacing strategies and show similar pacing profiles during time trials in training when compared to ‘real-world’ competitions, but swim each lap slightly faster in a competitive environment . Potential reasons for these observations are that competitive swimmers usually learn pacing skills from an early age on and, unlike open-water swimmers, full race distances at close to race-pace can be regularly performed during training. These accumulated experiences and memories then allow the development of a robust anticipatory pacing ‘template’ against which the current psychophysiological state can be compared and interpreted. The greatest potential for errors in pacing is therefore likely to occur under constraints of amplified psychophysiological duress such as during competitions. Avatar (read: pseudo-competition) studies investigating the performance-enhancing effects of a competitive environment on average report performance improvements of around 2%, although we have shown that the very opposite holds true for athletes falling behind a performance matched competitor during ‘real’ head-to-head competitions [10,11]. Analyses of ‘real-world’ competitions in long-distance events accordingly show different and more complex responses to competition. Here, less competitive athletes often tend to start too fast by following the leading athletes, which inevitably leads to premature fatigue and eventually absolute and relative underperformance in comparison to the race leader and the athlete’s individual performance capabilities, respectively . Thus, while more competitive athletes utilize a physiologically efficient even pace to step-by-step eliminate their weaker competitors, less competitive athletes sooner or later fall behind, eventually leading to an inefficient positive pacing profile. Over shorter middle-distance events such as 1500m in running and 400m in swimming, medallist show a more conservative pacing strategy in the first half of the race followed by a greater increases in speed during the last quarter of the race, collectively contributing to large performance differences in the last quarter when expressed relative to equal splits of average race time . Thus, more competitive athletes have the physiological surplus capacity and therefore the ‘luxury’ of tactical/behavioural flexibility to safe ‘anaerobic’ resources for the final decisive quarter of the race, while less competitive athletes ‘must’ perform slightly above their limits from the start, thereby draining finite ‘anaerobic’ resources throughout the event; subsequently limiting the capacity for an endspurt. This greater variability in successful championship performers, however, contrasts with world-record developments in running the mile, which is characterized by a progressive reduction in variation of pace as variations in speed are a waste of kinetic energy . Collectively, the above indicates that pacing strategies and observed pacing behaviors vary between winning race performances, where the position is the primary outcome measure, and personal record performances, where time is the primary outcome measure. Given that pool-swimmers compete in separate lanes (i.e. no tactical positioning, drafting etc.) and the large resistive forces of water, care should be taken not to start too fast and to minimize variations in speed except when used as a deliberate competitive pacing strategy. 4. How can a swimmer determine a pacing strategy is best for them? From the discussion above it should become clear that there is no single best pacing strategy. The optimal pacing strategy is therefore context-dependent on multiple factors such as distance/duration, goals (e.g. rank-based versus time-based goals), other competitors, tactics (e.g. saving energy in preliminary heats) amongst others. Nevertheless, in most cases every but the most gifted and superior swimmer eventually will have to minimize race time and approach or ideally surpass their personal best to increase the likelihood of achieving the best possible rank/position in a given race. As mentioned previously, this holds particularly true for pool-swimmers, who, unlike cyclists, runners, and open-water swimmers, compete in separate lanes and therefore do not benefit from tactical positioning and drafting. Pool-swimmers should, therefore, seek pacing strategies that are geared towards minimizing variability in speed and race time and not primarily rely on other competitors’ behavior, which is out of the athlete’s control. Notwithstanding the above, the best pacing strategy for an individual swimmer in a given event is simply the one that minimizes swimming time over the given distance. Most experienced swimmers will therefore automatically gravitate towards and exhibit the above-described pacing profiles for the respective distance/durations more or less closely [7–9]. However, subtle differences in pacing behaviors between individual swimmers will and must occur, as the observed pacing behavior reflects the complex and dynamic underlying psychophysiological processes. For example, a 100m freestyle specialist will likely exhibit a slightly different pacing profile swimming the 200m compared to a 400m freestyle specialist swimming the same distance. This is due to the respective differences in aerobic and ‘anaerobic’ capacities and their combined allocation aimed at maximizing performance. Thus, the 400m specialist would, therefore, be expected to maximally utilize the greater aerobic capacity by pushing the envelope during the middle section, while the 100m specialist would be expected to maximally utilize the greater ‘anaerobic’ capacity by mobilizing the superior ‘anaerobic’ reserves and peak velocities during the final lap. These differences will become most obvious during competitions when the pacing strategy will be geared towards maximizing one’s own physiological strengths while also exploiting the anticipated physiological weaknesses of other competitors. Thus, in pushing hard through the middle section, the 400m specialist forces the 100m specialist to either fall behind during the middle section or prematurely invest finite ‘anaerobic’ resources, thereby robbing the 100m specialist from the opportunity to maximally utilize her/his superior peak velocity during the final lap. Accordingly, there are strong correlations between middle section swimming velocity and overall finishing time in 200m and 400m events and strong correlations between final lap swimming velocity and overall finishing time in the 100m events . Ultimately, as physiological (e.g. physiological conditioning, fatigue, metabolic reserves, etc. ), psychological (e.g. effect, motivation, volition, etc. ), and social (i.e. athlete-environment interactions) factors change, so must the optimal pacing strategy to accommodate for the current psychophysiological state. A certain amount of behavioral flexibility is therefore of the essence to continuously perform at the limit of the athlete’s current potential. 5. How can coaches help their swimmers find the appropriate pace? As mentioned previously, the average pacing profiles over the various event durations/distances and strokes are relatively robust and can, therefore, be used as a reasonably close starting point to inform and communicate with swimmers about their individual profiles. The key point here is to acknowledge the important role of optimal pacing behavior in swimming performance in the first place and to educate swimmers about potentially debilitative aberrations from optimal pacing profiles. This will be particularly useful in inexperienced swimmers, who have not yet developed a robust pacing ‘template’ and sufficiently precise perceptual skills. However, even in elite swimmers, who differ very little in their performance abilities and physiological capacities, it is worthwhile to continuously fine-tune pacing skills as there is very little room for physiological performance improvements and the wastage of kinetic energy subsequent from starting a race too fast or too conservative could mean the difference between the winner and the ‘also-swum’. Coaches can help their swimmers by visualizing and discussing individual pacing profiles from races as well as race simulations and time trials during training, although care should be taken not to overinterpret findings from training analyses based on hand-timing with stopwatches, which are prone to too great measurement errors and thus may lack the required accuracy. Unfortunately, most coaches will not have access to the more sophisticated equipment necessary to dial into more detailed analyses such as within-lane dynamics of start and turning times, mid-pool swimming velocity, stroke length and rate, and other performance variables. Thus, in most cases, assessment and analysis of lap times (ideally collected using timing mats) will have to suffice. Pacing skills can be learned, improved, and trained using simple perception-based swim sets such as providing varying target times or target efforts over the same or varying distances that then need to be matched by the swimmer. Alternatively, standard interval sets can be timed and analyzed for consistency, ideally in combination with additional psychophysiological measures, which can inform the coach and athlete about antecedents and consequences of miss-pacing, thereby allowing to look out for and react quicker to dynamic changes in determinants of pacing behavior in the future. Another method aimed at pro-actively changing swimming pace are the Aquapacer™ and Tempo Trainer Pro™, which are audible pacing devices that can be placed under the swimming cap close to the ear and be used to alter and guide swimming speed and stroke rate. However, swimming speed is the product of stroke length and stroke rate. Therefore, care needs to be taken to ensure that increases in stroke rate do not deviate too far from the individual’s sweet spot and thus aren’t nullified by a reduction in stroke length due to deterioration in technique. In 200m breaststroke swimmers it was found that the pacing device can reduce random error in pacing (i.e. it may be superior to a poolside clock at least in less experienced swimmers), enable maintenance of race-specific swimming speeds to exhaustion, and allow subtle manipulation of race-specific swim pace . Thus, it can help create awareness of small differences in pace (e.g. between 98%, 100%, and 102% of maximal time trial speed) and prepare enduring and tolerating the amplified physiological and perceptual responses as well as train the maintenance of technique under the constraint of intensified psychophysiological duress as experienced during ‘real-world’ competition . In addition, some swimmers do not self-select and exhibit the most appropriate pacing behavior by themselves. Thus, coaches can use the same technology to manipulate and experiment with varying starting paces (e.g. start 2-3% faster or slower than during self-paced time trial), which has been shown to elicit performance improvements in some individuals . A technologically more advanced but less accessible method is the use of under-water pacing lights, although this method too is based on average speeds per lap and therefore also cannot perfectly account for the variations in speed that occur between the turn and subsequent dive phase and mid-pool swimming velocities. The ‘free version’ of this method is the use of an experienced swimmer as a pace-maker, who sets a predetermined pace to be followed by another swimmer. Ultimately swimmers need to have a certain amount of behavioral flexibility to select the pace that is optimal for the current psychophysiological state and therefore needs a repertoire of different pacing strategies and behaviors. This can only be achieved by continuously adjusting and fine-tuning the pacing skills based on the ever-changing dynamics in internal (i.e. the swimmer’s perceptions and cognitions) and external (i.e. imposed by the coach or competitors) constraints. For a recent review of the effects of different kinds of pace, manipulation sees Skorski and Abbiss, 2017 . 6. How do you feel about deceptive pacing practice and should coaches implement it? Interventions using deception to manipulate performance and pacing behavior are very interesting as they indicate that athletes exercise with a physiological reserve. Studies using manipulation of time, distance, anticipated endpoint, feedback, and virtual competitors consistently find that performance can be improved by around 2% but fail to improve performance when deception is greater than 2% as these elicit too great a homeostatic disturbance and therefore get detected [18,19]. Most recent studies manipulated avatar performances set at 102% of baseline time trial times while letting participants believe it was set at 100%. Deceived participants improved their individual time trial performance by mobilizing their ‘anaerobic’ reserves to a greater extent compared to accurate feedback . In partial contrast, another study found neither performance nor physiological differences between accurate and deceptive feedback but more negative perceptual responses (i.e. greater perceived exertion and more negative effect) during the deception trial concluding that motivational factors of simulated competition rather than deception per se contribute to the observed performance improvement . Interestingly, yet another study found that when informed about the deception, participants were then able to reproduce the elicited performance gains in a subsequent trial . Thus, sensory, affective, and cognitive processes and their interactions need to be considered when using deception to manipulate pacing behavior and performance . In the end, the use of deception in praxis is a double-sided sword. On the one hand, it is a useful tool in pacing research and potentially a viable tool to improve performance and manipulate pacing behavior. For example, deception can be implemented implicitly to push certain swimmers to mobilize psychophysiological resources to a greater extent than they are usually willing to invest and tolerate during training. Deception can also be used to break-down mental barriers in certain swimmers that lack confidence in their ability to break their personal best or a certain time by deliberately miss-informing about achieved performances in training. On the other hand, deception can have considerable negative consequences such as greater physiological strain and perceived exertion as well as negative affective responses. Thus, coaches need to be aware that there is a considerable variability in inter- and intra-individual responses to deception and the acute facilitative effects may not translate to the desired residual alteration in pacing behavior and performance [21,23]. While inducing greater psychophysiological strain through deception may be a reasonable strategy very for one swimmer, it may elicit these responses to a greater than anticipated or planned extent in another swimmer with potential negative psychophysiological consequences such as excessive fatigue, overuse injury, frustration, and discouragement. Thus, performance and psychophysiological outcomes in response to deception are manifold and at least for the individual swimmer largely unpredictable. In addition, swimmers and coaches often have close relationships, which developed over prolonged periods and the detection of deception by the swimmer can quickly undermine this hard and long earned trust. Ultimately, there is ample evidence for the efficacy of deception and when very carefully and scarcely implemented it may be a valuable tool for the experienced coach. However, the regular use of it must be avoided and the high risk of negative biopsychosocial consequences needs to be taken into thorough consideration. 7. What future research can the swimming community benefit with in regards to pacing? Research on pacing in swimming so far has largely focussed on merely describing pacing profiles based on lap times. More recently, researchers began to investigate the effects of pace manipulation (i.e. starting 2-3% faster or slower than in self-paced time trial) on performance. However, very little is known about why and how swimmers pace themselves the way they do. Thus, gaining a better understanding of the psychophysiological determinants of pacing behavior will prove vital for greater individualization and optimization of pacing behaviors and performance. First, more sophisticated technology needs to be utilized to advance our understanding of within-lap variations in swimming velocity. Advanced hard- and software has been developed and is available in some high-performance aquatic centres (although due to high costs these are unfortunately not readily available to most researchers and coaches) to analyse in more detail how start and dive, turn and dive, and finish sections, as well as free mid-pool swimming velocity, contribute to overall lap times. Such data will greatly assist in identifying the strengths and weaknesses of individual swimmers. Unfortunately, combining these individual components to the best overall finishing time and pacing strategy will still have to be explored by the coach through trial and error for each individual swimmer. Second, the mechanical efficiency of swimming is low, the resistive forces of water rise in a quadratic fashion (compared to linear increases in resistive forces of air), and there is a disconnect between power output and speed during start, turn, and dive phases and free swimming mid-pool velocity. Thus, the measurement of power output carries the potential to contribute to a deeper understanding of the underlying energetic processes and demands and eventually the observed pacing behavior. Another great advantage of measuring power is the ability to deduce when efforts become inefficient, which is particularly critical for a technique-based sport such as swimming. The measurement of power is now customary in cycling (due to the ease of measuring the force x velocity product) and first devices have been developed to measure power in runners (by replacing the force term and measuring the mass x acceleration x velocity product instead). Unfortunately, power measuring devices have not yet been developed for swimmers but as technology advances power measuring devices for swimmers will hopefully be developed and available soon. Lastly, we recently introduced a three-dimensional framework of centrally regulated and goal-directed exercise behavior, which emphasizes the sensory, affective, and cognitive components of perceived fatigability and their interactions with performance fatigability . This integrative and comprehensive psychophysiological approach has been shown to more completely account for the dynamic changes in observed pacing behavior and performance [10,11]. Unfortunately, due to its complexity, it is most feasible to be applied during prolonged endurance exercise on treadmills and ergometers. However, we aim to utilize this framework in future studies by applying it to a long-distance pool- and open-water swimmers. Venhorst A, Micklewright D, Noakes TD. Towards a three-dimensional framework of centrally regulated and goal-directed exercise behaviour: a narrative review. Br. J. Sports Med. 2017;0:1–12. Abbiss CR, Laursen PB. Describing and understanding pacing strategies during athletic competition. Sports Med. 2008;38:239–52. Thompson KG. Pacing: Individual strategies for optimal performance. Champaign, IL: Human Kinetics; 2015. Mauger AR, Neuloh J, Castle PC. Analysis of pacing strategy selection in elite 400-m freestyle swimming. Med. Sci. Sports Exerc. 2012;44:2205–12. Mytton GJ, Archer DT, Turner L, Skorski S, Renfree A, Thompson KG, et al. Increased variability of lap speeds: Differentiating medalists and nonmedalists in middle-distance running and swimming events. Int. J. Sports Physiol. Perform. 2015;10:369–73. Robertson E, Pyne D, Hopkins W, Anson J. Analysis of lap times in international swimming competitions. J. Sports Sci. 2009;27:387–95. Skorski S, Faude O, Caviezel S, Meyer T. Reproducibility of pacing profiles in elite swimmers. Int. J. Sports Physiol. Perform. 2014;9:217–25. Venhorst A, Micklewright D, Noakes TD. The psychophysiological determinants of pacing behaviour and performance during prolonged endurance exercise: a performance level and competition outcome comparison. Sport. Med. 2018;0:1–14. Venhorst A, Micklewright D, Noakes TD. Modelling the process of falling behind and its psychophysiological consequences. Br. J. Sports Med. 2017;0:1–6. Renfree A, St Clair Gibson A. Influence of different performance levels on pacing strategy during the Women’s World Championship marathon race. Int. J. Sports Physiol. Perform. 2013;8:279–85. Foster C, Koning J de, Thiel C. Evolutionary Pattern of Improved One-Mile Running Performance. Int. J. Physiol. Perform. 2014;9:715–9. Thompson KG, MacLaren DPM, Lees A, Atkinson G. Accuracy of pacing during breaststroke swimming using a novel pacing device, the AquapacerTM. J. Sports Sci. 2002;20:537–46. Thompson KG, MacLaren DPM, Lees A, Atkinson G. The effects of changing pace on metabolism and stroke characteristics during high-speed breaststroke swimming. J. Sports Sci. 2004;22:149–57. Skorski S, Faude O, Abbiss CR, Caviezel S, Wengert N, Meyer T. Influence of pacing manipulation on performance of juniors in simulated 400-m swim competition. Int. J. Sports Physiol. Perform. 2014;9:817–24. Skorski S, Abbiss CR. The manipulation of pace within endurance sport. Front. Physiol. 2017;8:102:1–8. Williams EL, Jones HS, Sparks S, Marchant DC, Micklewright D, McNaughton LR. Deception studies manipulating centrally acting performance modifiers: A review. Med. Sci. Sports Exerc. 2014;46:1441–51. Jones H, Williams E, Bridge C. Physiological and Psychological Effects of Deception on Pacing Strategy and Performance: A Review. Sport. Med. 2013;43:1243–57. Stone MR, Thomas K, Wilkinson M, Jones AM, St Clair Gibson A, Thompson KG. Effects of deception on exercise performance: implications for determinants of fatigue in humans. Med. Sci. Sports Exerc. 2012;44:534–41. Jones HS, Williams EL, Marchant DC, Sparks SA, Bridge CA, Midgley AW, et al. Deception has no acute or residual effect on cycling time trial performance but negatively effects perceptual responses. J. Sci. Med. Sport. Sports Medicine Australia; 2015;19:771–6. Shei R, Thompson K, Chapman R. Using deception to establish a reproducible improvement in 4-km cycling time trial performance. Int. J. Sports Med. 2016;37:341–6. Jones HS, Williams EL, Marchant D, Sparks SA, Bridge CA, Midgley AW, et al. Improvements in cycling time trial performance are not sustained following the acute provision of challenging and deceptive feedback. Front. Physiol. 2016;7:1–9.